DigitalSEO is a modern and flexible WordPress theme, the theme is designed for SEO company, Marketing Agency and their clients. DigitalSEO is perfect for any kind of SEO or service based company website. We specially added some tools for case study, services box, call to action u0026amp; other visual elements. DigitalSEO is lightweight so it loads very fast. DigitalSEO also supports translating features so you can translate this theme with any languages you want. 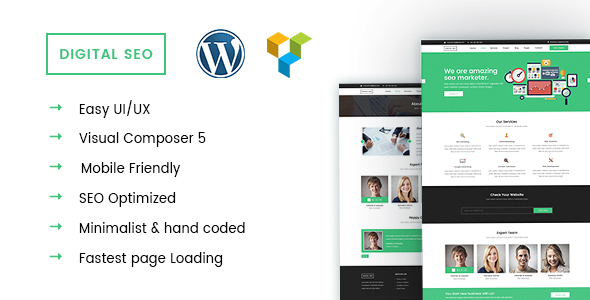 Theme Features Customized Slider Redux Framework Visual Composer Faster Load Responsive 1 click demo import WPML u0026amp; language po file Note: Demo images is not included on main purchase. Changelog 09, November, 2017 - Version 1.2 Updated Required plugins. Compatible with WooCommerce 2.6.x, WooCommerce 2.5, WooCommerce 2.4.x, WooCommerce 2.3.x, WooCommerce 2.2.x, WooCommerce 2.1.x, WooCommerce 2.0.x. DigitalSEO has been tested with browsers IE11, Firefox, Safari, Opera, Chrome.